Interest in the role of nutritional factors and cancer began in earnest following the 1975 Key Biscayne, FL International Symposium entitled, Nutrition in the Causation of Cancer. Since then, literally thousands of publications have appeared ranging from epidemiological and animal model to genomic studies. These studies have ranged from the cancer preventing effects of food groups to specific foods, and to specific biologically active agents in foods, such as carotenoids, curcumin and isoflavones. Clearly, however, over the past 3 decades, the preponderance of attention paid by the US National cancer Institute (NCI) has been, not to dietary factors, but to genetic factors, despite the fact that genetic factors have been shown to affect roughly only 5%-10% of all cancers. With this discrepancy in mind, Christopher Wild, Director of the International Agency for Research on Cancer, introduced the term the exposome, which includes the total spectrum of the environment i.e., UV radiation, industrial toxins, pollutants and the foods we consume and warned that in order to significantly reduce cancer incidence and mortality more attention must be paid to environmental agents. This brings us to the contents of this eBook. Until coming upon Dr. Shamsuddin’s work, my interest in inositol and its various metabolites was limited to its role as an essential nutrient for culturing cells in vitro. The complex metabolism of inositol compounds has been the subject of numerous reviews. In this fascinating and revealing eBook, Dr. Shamsuddin has diligently culled the literature dealing with InsP6 popularly known as IP6, a phosphorylated derivative of inositol, in relation not only to cancer but to other diseases including osteoporosis, diabetes, kidney stones, heart disease etc. This review covers evidence gleaned from animal model, cell culture and gene expression studies and a limited number of clinical trials, suggesting that IP6 has numerous health benefits besides industrial uses. Not surprisingly, none of the major granting agencies or research organizations has been supportive of this research. The anachronistic standards of the US National Cancer Institute, which require injecting agents into the circulation and measuring blood levels, are standards that do not apply to orally available agents such as IP6. In sum, despite the fact that there is a vast literature on the metabolism of inositol compounds, there is no authoritative account extant of the role of inositol phosphates in health and disease. Dr. Shamsuddin, who has devoted much of his career to IP6 research, has filled this void with a very readable, well-documented and balanced review. This eBook will, no doubt, prove of interest to basic scientists in natural and biological sciences as well as to practicing physicians. Since discovered in the mid 1800’s in plant seeds, inositol and its hexaphosphate (IP6, or more accurately InsP6), particularly InsP6 have enjoyed varying degree of reputation or infamy. Initially InsP6 was considered an important component of seeds; then the acid form’s metal chelating property was appreciated by chemist, the same attribute was then incriminated for mineral deficiency by nutritionist, for a very long time. Then came the discovery of inositol triphosphate (InsP3) and tetraphosphate (InsP4) in yeasts; and InsP6’s anticancer and immune boosting action in the 1980’s. All through this, the knowledge has been compartmentalized or boxed in so to speak. In other words, there has not been much, if any interdisciplinary communication and; perhaps a lack of in-depth research in the prevailing scientific literature. For instance, that large doses of InsP6 was successfully used for prevention of kidney stone back in the 1950’s (from institutions no less than Harvard University and Massachusetts General Hospital in Boston, and published in the New England Journal of Medicine) remained largely unknown, even to the researchers in the field, and worse, those from the same institution, as gathered from review of literatures and omission of citations. Likewise, the earlier reports on the biochemistry and metabolism of inositol phosphates (InsPs) in eukaryotes make no mention of their presence in the plant kingdom; and till now, many simply fail to comprehend and therefore chose to ignore the anticancer property. This scenario is akin to the proverbial description of an elephant by the visually impaired, each of whom has an idea of the parts they have felt, albeit in a limited manner; but the whole is not understood. Addressing this lack of interdisciplinary knowledge, thus the purpose of this eBook is to give as comprehensive an account of inositol and its phosphates, especially InsP6 - the ‘elephant in the room’ as possible. The contents of the eBook are for a wide range of readers consistent with the wide and divergent functions and applications of inositol and its phosphates. To cater to a broader audience from physical sciences as well as biological sciences, we have often used terms and information that some may find too basic while others not; this has also been deliberate. Owing to the vast amount of literature on the chemistry, metabolism and biosynthesis of InsPs we have chosen to limit the discussion on that, but focus more on areas that we think are poorly represented in the literature. There are certain overlaps in presentation of the materials that are not only unavoidable, but to some extent intentional: unavoidable because the mechanisms of actions are related to practical applications, especially in biological fields; and it was intentionally done to readily recall the connection between the cause and mechanistic effect, as the two are often inseparable, to get the whole picture to satisfy our intellectual curiosity without having to go back and forth to the relevant chapters. 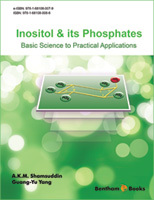 Finally, we hope that this eBook will help more interdisciplinary communication and research to further enhance our understanding and usage of inositol and its phosphates for betterment of life in this planet. The authors confirm that this eBook content has no conflict of interest.